The Hero's Journey: Cliffs Notes Version | Write Your Own Story! I believe in the power of Storytelling. I believe it is a universal language that transcends cultural, racial, religious, gender, or political divides. Most of us read books, or have done so. I don’t care if you haven’t picked up a book since your high school lit teacher forced you to read Beowolf, or that time you Cliffs Notesed your way through The Stranger. Your parents probably instilled in you an innate understanding of myth and folklore, dictating classic Fairy Tales or modern treasures like Where the Wild Things Are or The Cat in the Hat. Most of us watch TV and films. Even the most godforsaken, bloody awful, I’m-actually-embarrassed-for-him Adam Sandler movie employs classic Storytelling techniques. Everyone understands Storytelling on some level. Even Adam Sandler. Throughout this blog I will embark on my own Heroic Quest, as if I were the main character in a film or novel. In essence, I will apply the Hero’s Journey and other storytelling conventions as a kind of self-help program, without the creepy, cult-like, quasi-religious seminars led by the charismatic dude with the headset microphone. My goal is to emerge Transformed. I have included the graphic below as a brief introduction to some of these concepts. 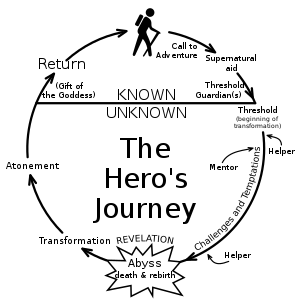 The Hero’s Journey comes from Joseph Campbell, who documented a basic pattern found in many narratives from around the world. If you have never heard of Campbell, he was kind of like Obi-Wan Kenobi to George Lucas’ Luke Skywalker; a huge influence and mentor-figure. I have to go. The Unknown awaits. Pingback: WM seeking an older Mentor-figure, Beard is a must!! | Write Your Own Story!